Former Target employee David Smith, right, talks about his struggle as advocates hold a press conference for the "Fair Workweek" scheduling bill before a City Council hearing Tuesday afternoon. The "Fair Workweek" scheduling bill for retail, fast-food, and hotel workers in Philadelphia got one step closer to becoming law Tuesday. Championed by advocates, union leaders, and researchers as a way for workers to gain more control over their lives and break out of a cycle of poverty, "Fair Workweek" laws have been implemented in such cities as San Francisco, New York, and Seattle. 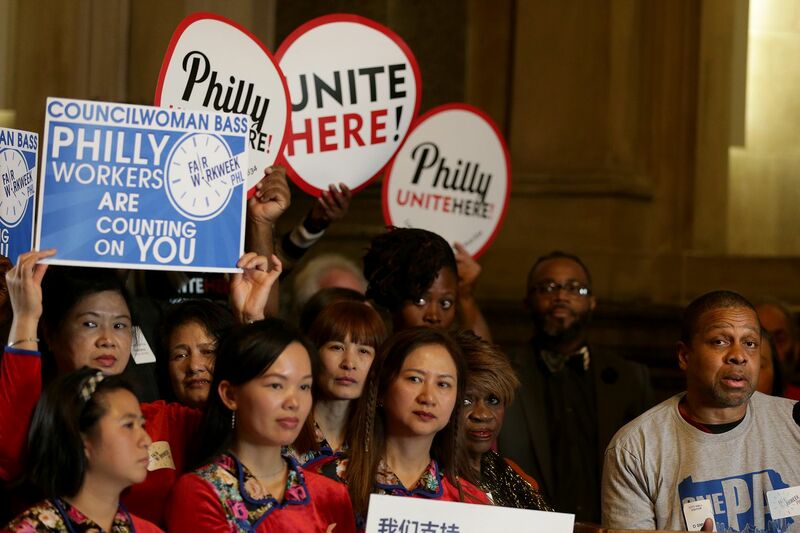 But Philadelphia, the poorest big city in the nation, has not seen job growth like other cities have, as deputy commerce director Sylvie Gallier Howard pointed out during the hearing, warning of laws that might hinder job creation. The law, if passed and enforced — the latter is an enormous "if" — could have a broad effect on the 130,000 Philadelphians working in retail and food service. In a survey of nearly 700 of those Philadelphia workers, 66 percent said they had unpredictable schedules, according to a February 2018 report from the University of California, Berkeley's hourly work research center. Lekesha Wheelings, a cook who has worked at the Philadelphia Marriott Downtown for 11 years, said she saw her hours fall in 2017 and made $5,000 less than she did the previous year. "You can see that the city is growing in so many ways," she said. "But sometimes it feels like we're not getting ahead." This bill, she said, is "a way forward for our city." The hearing depicted recent shifts in the national labor movement. With union representation at a historic low, organizers and politicians have set their sights on fighting for the rights of workers who aren't backed by organized labor. Union leaders and their membership showed up to support the bill regardless. "We realize that the 130,000 workers in the retail, food, and hospitality workplaces do not have the benefits and protections that we receive as members of AFSCME," said Fred Wright, president of municipal workers' District Council 47. Industry leaders and business groups testified against the law at the hearing, saying it would hurt their bottom line when they already face thin profit margins. These industries are inherently unpredictable, business leaders said at the hearing. In Seattle, Aramark staffs every event and location covered by the law "as leanly as possible," according to Brian Hastings, Aramark's district manager. Before the law there was passed, when business was good, workers would get more hours, he said. Now, because of the "predictability pay" penalty for last-minute shift changes, the company can't do that. Managers representing the Greater Philadelphia Hotel Association also spoke out against the law, saying that it could drive up prices and make rates less competitive. Julie Coker Graham, president and CEO of the Philadelphia Convention and Visitors Bureau, reminded Council that the city's tourism industry is booming. It's the city's second-largest employment sector overall, she said. In other cities that have passed "fair workweek" laws, hotels have not been covered. But hotel workers, too, deal with unpredictable scheduling, as workers at the Philadelphia Marriott Downtown have said. The retail and hospitality industries compose about 20 percent of the jobs in Philadelphia and are among the fastest-growing in the city, according to data from Mayor Kenney's workforce plan. Since Council Member Helen Gym introduced the bill with seven other sponsors in June, she has met with lobbyists from national corporations, including Target, according to city lobbying data. She's also hosted business round tables to get feedback from the community. Earlier this month, Gym hosted Seattle Council Member Lorena Gonzalez, one of the officials who championed the scheduling bill there, to speak to City Council about the merits of the law. The bill is scheduled for a full vote Nov. 29.